RVTools is a windows .NET 2.0 application which uses the VI SDK to display information about your virtual machines and ESX hosts. Interacting with all versions of VirtualCenter and ESX Server RVTools is able to list information about VMs, CPU, Memory, Disks, Partitions, Network, Floppy drives, CD drives, Snapshots, VMware tools, Resource pools, Clusters, ESX hosts, HBAs, Nics, Switches, Ports, Distributed Switches, Distributed Ports, Service consoles, VM Kernels, Datastores, Multipath info and health checks. Below is an example of the new cluster tab. Below is an example of the new Multpath tab. It has been almost a year since the last version was released, but that is ok because this tool is FREE and is works great. Sure I could write a powercli script to get a lot of this information, but it’s nice to get all of this information in a single click. It also gets all of this information very fast because it uses the VI SDK. I have been using this tool for a few years and it is one of my favorite documentation collection / troubleshooting tools. Every year Eric Siebert (Twitter: @ericsiebert) of vsphere-land.com hosts the runs the survey of the top virtualization blogs. The survey to select the top virtualization blogs for 2014 is now open. You can vote here. This will be the first year that this blog will be participating in the poll. If you like what you have seen so far, feel free to vote for my blog in the every category I am listed in. 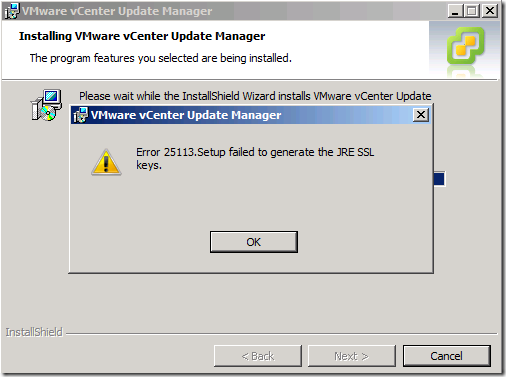 A quick search on the interweb for “Error 25113.Setup failed to generate the JRE SSL keys” and I found a VMware KB with the exact issue. According to VMware KB 2059567 all version of vSphere 5.x are affected by this bug. Not sure if this is common knowledge to everyone else, but this is the first time I have seen this error. I have done many upgrades and have never seen this before. The solution is simple. Just stop the vCenter Update Manager service before starting the upgrade. Right after stopping the service, the installation was successful. Apply and Become a VMware vExpert 2014! As with last year, there are three paths to being designated a vExpert. Each path takes into account the accomplishments and activities over the last year. I signed up for WordPress today. I would like to start blogging about technology and virtualization at least once a month. I would also like to try to add a custom URL since I already own my own domain.